By Newbold & Co. Ltd., London. Stores Ref. 22c/156. Fragile lightweight wire frames with laminated glass lenses, celluloid side-shields, rolled sponge rubber nose-rest and anti-glare 'flipshield'. Fitted with short side-arms, each having a female press-stud at the end that connected with a press studded metal plate sewn to the flying helmet of the user. The frame is in good condition with only minor distortion, light paint chipping/loss and general soiling. The tinted lenses have some delamination marking and the side-shields are a little warped as usual. The rubber nose-roll has minor deterioration at the bridge and ends (see photographs) but is in good overall condition. Light scratches on the flipshield. 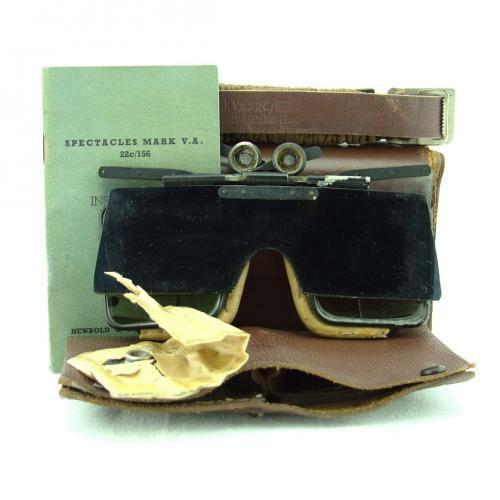 The spectacles come in the original 'hand sewn' rigid leather case with original leather spares wallet containing 1 pair of clear lenses (with delamination marks) and bakelite tube of 'Everclear' de-mist compound. A small paper envelope contains two press studded plates and a hook/clip that would have been sewn to the flying helmet to retain the specatacles in place. Also comes with the 'headband' strap and illustrated instruction booklet. One spare set of lenses and a small screwdriver are the only missing items. The strap is in excellent unused condition and has super crisply embossed Air Ministry king's crown marks and reference numbers. The instruction booklet is soiled and a little dog-eared. Intended for the use of observers and gunners and pilots, these are extremely rare spectacles/goggles - seldom seen today, especially with the accessories and the forehead clip that is so often missing. Additional photographs available by request.Stock code G19413.